How cute is this eyelet top? The bows on the shoulder lets you adjust the length and is so on-trend. 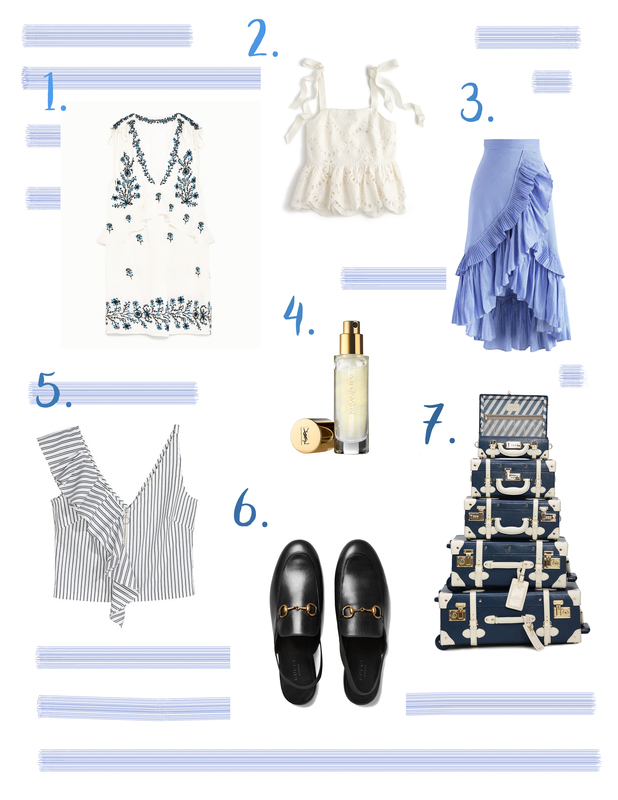 The perfect summer blue skirt will give even your simplest white shirt a romantic twist. This primer is admittedly a luxe buy, but worth every penny. I usually don’t bother with primer but this is holy grail status. It doesn’t make me break out, or dry out my already dry skin, and makes foundation go on super smooth. No pilling or patchiness here! Plus, the refreshing cucumber scent makes it a treat to put on in the morning. Love the different stripes on this shirt. Plus, the round zipper gives it a retro twist. I’ve been eyeing these loafers for so long. The sling back detail keeps it from being basic and the design is so classic. Warm weather stirs up my wanderlust and I’m in love with these suitcases. They come in many colors but the navy is my favorite. How are you spending your summer? Any favorites you want to share with me? *I am not sponsored or paid to share my picks with you. Just sharing what I’ve been loving lately. This entry was posted in beauty, fashion, Summer, Weekday Update and tagged beauty, dresses, fashion, makeup, shoes, summer fashion, Weekday Update. Bookmark the permalink. I like that eyelet top and blue ruffle skirt! And the stripe shirt with round zipper is so chic! I should put them in my shopping cart! Thank you! I now what you mean, I’ve been wanting to buy everything these days. Did you end up purchasing anything?